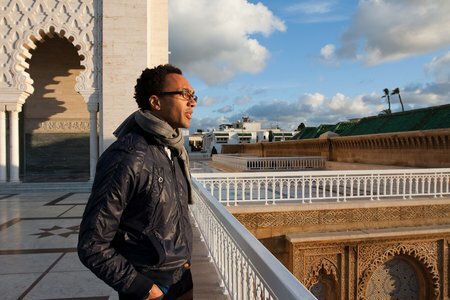 I’m a week into this preliminary research trip for Beyond Digital – Rabat, Marrakesh, and tomorrow, Casablanca. A huge thanks goes out to Marjana, her helpfulness and generosity have made this excursion far more efficient and amazing than would have otherwise been imaginable. Here’s a photo she took of me peering into the distance at Rabat’s Tour Hassan. The Atlantic meets the land in Rabat with a specific kind of rough poetry. I always enjoy seeing how cities deal with the bodies of water that touch them. The last time I was in Morocco was twelve years ago. And then only briefly. I feel like I’ve changed more than the country has, which may be true of most places + people with a dozen years between visits. Musically, this has been a rich trip. Learning a lot! One of today’s discoveries: Izenzaren إزنزرن, a kind of golden era Amazigh Nass el Ghiwane, spiritual godfathers to Oudaden, if that means anything to you… For reasons I have yet to discover, unlike Casa and Rabat, there are no MP3 CDs for sale in Marrakesh. It is all audio CDs! A surprise in today’s increasingly compressed times. I’ve been recording some late-night radio as well as purchasing CDs — also sharing some music I have with those who want it here. Unfortunately I can’t rip or upload audio right now. For a muddy fix, tune in to my radio show tonight – Monday 7-8pm EST WFMU 91.1fm NYC, and check back here very soon for Maghrebi sounds. In the meantime, Youtube. Here’s Izenzaren: They sing in Amazigh and say YES to vocals through generous delay. Especially around 2:45, when someone sets it to a trippy half-second setting. So many ways to negotiate the relationship between body and voice. The last person I saw to sing through delay like that was Lizzie from Gang Gang. After some meetings in Rabat, we drove to Marrakesh, where I’ve spent most of the week. Late night radio there (90.5 and 97.1 FM) sounds a bit like this, or at least it did yesterday. Abdelhadi Belkhiate عبد الهادي بالخياط. His ‘oriental’ style is a welcome reminder that the best Arab singers of the 60s and 70s got the best backing bands. excited to get a real-deal audio CD (or 3) — enjoy.